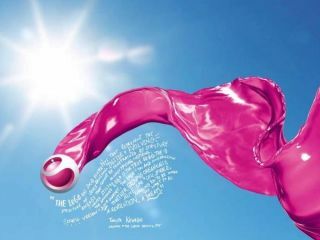 This indicates the new Sony ethos - it IS NOT PHALLIC - okay? Sony announced to the world its new make.believe vision at its keynote at IFA, and phone arm Sony Ericsson will, apparently, also adopt the new corporate message. Although writhing pink fluid with a Sony Ericsson branded tip may not perhaps bring to mind handsets for most of us, it is one of the approved 'new direction' images that has just landed in the TechRadar inbox. "Sony Ericsson today announced the next stage of its on-going business transformation with the realignment of its external visual identity and brand values in order to deliver its vision of becoming the Communication Entertainment brand," said Sony. "The company also confirmed its adoption of the newly announced Sony brand message 'make.believe' in all consumer communication in order to reinforce its entertainment credentials and collaboration with the Sony Group." "Our ongoing business transformation is laying the foundations for the new Sony Ericsson. Our re-aligned brand is a vital part of this strategy," said Lennard Hoornik, Head of Marketing at Sony Ericsson. "Combined with a new culture of openness it marks a shift in the way we plan and build our propositions, as well as how we invite consumers to engage with us via digital and social media platforms." So what does that mean? Well we don't really know either, but it will apparently bring expanded appeal of the 'liquid identity' logo by adding seven new colours, plus a new 'liquid energy' flowing from the logo to make it more playful and visually appealing for the digital arena. You can't make this stuff up. In fact, you have to pay someone else a lot of money to make.believe it up for you.